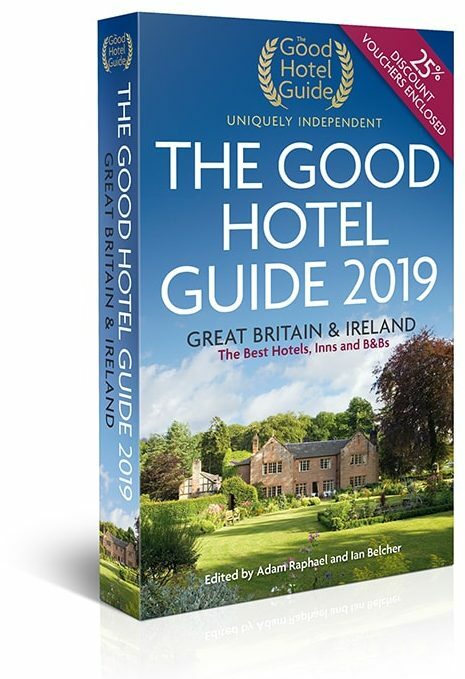 The Good Hotel Guide 2019 is the leading independent guide to hotels in Great Britain and Ireland. It enjoys that position as it is written for those looking for impartial advice on finding a great hotel in which to stay for a holiday, a short break or for a special occasion. This well-respected guide has been around for more than four decades. It covers every style, size and shape of hotel, but the key, and unifying feature, is evident quality. One can expect days of rain and poor weather – it’s the British Isles and Ireland, after all. One might be confined to a warm library with a blazing log fire, or a lounge with over-stuffed leather sofas on which to doze – that might add another dimension to a trip. But an iffy hotel with none of those charming facilities can spoil the whole vacation. Quality and ambience are the most important elements, and often the most memorable. If one is happy staying in a cookie-cutter hotel then you might not need The Good Hotel Guide 2019. You will be comforted to see that same picture over the bed in your predictable room in either The Hague or Hanoi (you won’t be able to tell the difference). But how much more interesting it is to stay in a more characterful hotel. Find your chosen destination region and see what’s on offer. There is an Editor’s Choice section for the pick of the bunch. The individual hotel profiles are full of information from number of rooms to background music. There is contact information and you will know if your dog is welcome before you even book your break. This is the perfect book for leafing through and planning. Build up the log fire (or snuggle with a hot-water bottle), pour a nice glass of something reviving and make plans. There could be that Victorian country house. There could be that Georgian estate. Nothing could be more romantic than a night or two in an 18th century sporting lodge. I have my eye on a mansion in Scotland!